Our Farm Products & Packages! Available as pay-per-visit or in a CSA-package (above). Even for those who don't love the typical flavor of goat's milk, this one will win them over! Our Guernseys produce sweet, creamy milk that's excellent for butter & cheese production. We even have buyers who turn it into soap and prefer it over other milks in the area - it truly can't be beat! We feed a small amount of locally-milled supplements at milking that contains the nutrients they need to produce high quality milk. Otherwise, our goats are fed a rich diet of grass and legumes. They are rotated between a dry lot and open pasture (as weather allows) to maximize parasite control. Our goats are not treated with antibiotics, coccidiostats, nor growth hormones (ever) while milking. 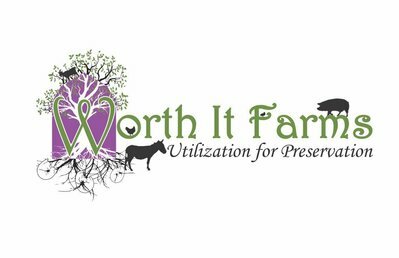 Parasite control is handled organically on goats and fertilizer throughout the farm is organic. 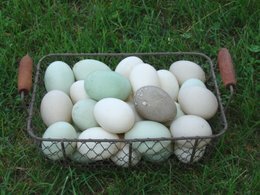 Pastured/Free Range Ancona Duck Eggs - SOLD OUT FOR 2018! Available as pay-per-visit or as an add-on to a CSA package. Collected daily. Washed with a mild soap (upon request) and refrigerated until pick- up/delivery. These eggs come in a variety of colors (blue/green, white/cream, and a light gray/lavender). 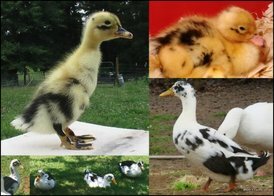 Our ducks are rotated between a dry lot and a pasture (as weather allows) to maximize parasite control and enrich the soil without damaging it - ducks can be rough on pasture, lol! We use them as small tillers to help in controlling our bamboo & kudzu problem for this reason. They are supplemented with locally-milled non-GMO layer pellets. Very select numbers available. Orders MUST be made in advance. Email for more details. Fresh Heirloom Produce - NONE FOR 2018 -Plans for 2019 though! We now offer small batch orders of vegetable and fruit. Our garden is managed very intensely, but only with OMRI-listed (Organic) herbicides, pesticides, and fertilizers. We use companion planting as much as possible to be able to "give back" to soil and to provide natural protection for our plants. Any * means not heirloom. We now offer poultry meat to pet owners interested in feeding their dog on the BARF/RAW diet. This is a quality product, raised to high standards. Our poultry are not given any growth hormones, steroids, or antibiotics before being processed. They are on a forage/pasture based diet supplemented with a locally-milled non-GMO layer pellet (with added probiotics) and fodder as needed. Health, of the bird and your pet, is our main concern! Because we are still a small, family-run farm, orders have to be taken in advance of availability. Please email us to find out what we will have and when it will be ready. All orders will be frozen after processing to ensure no meat spoilage. If you would like any of our products ground with bone-in, please email us to inquire about prices. GOAT MANURE ON SALE NOW! Goat manure is a "cold" manure, meaning it doesn't require any composting. We offer it for $5/5 gallon bucket (roughly 25 lbs) -you supply the bucket and you scoop- for the backyard gardener. You may pick up by appointment, just email to setup a time. We have a lot of partially composted goat manure to move out, so it is on sale until further notice. It is now only $5/trip. Take as much or as little as you want! You dig and load. We have plenty of bamboo too, take as much as you want of it too for the same price!